Tired of skein winders that can't handle big skeins or don't keep count for you? Sick of swifts that collapse during use or have an overall wimpy design? 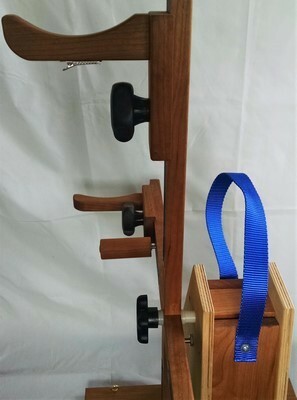 Created to function as a skein winder OR swift, this sturdy, handsome winder offers many features that make it an indispensable yarn handling tool whether you are dealing with a few skeins of handspun or miles and miles of yarn. 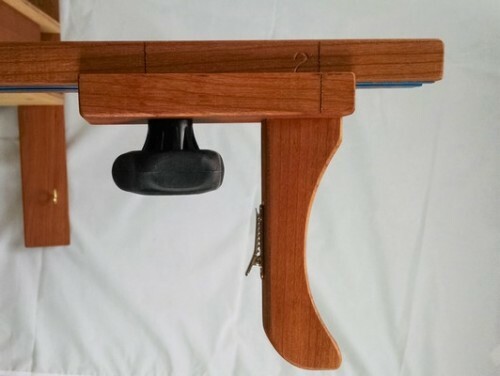 Meticulously crafted from cherry and Baltic birch woods, superior quality hardware, and the knowledge of what a fiber artist really needs in a piece of equipment. "This winder is a real work horse and I'm lovin' it. 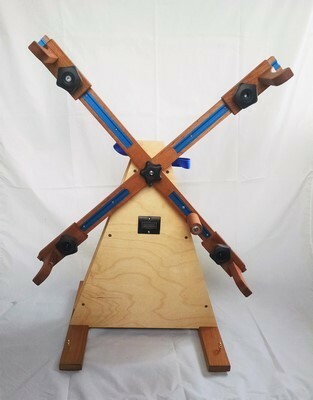 This piece of equipment is awesome and not only is it a great work horse, it's so easy to move around and the balance, both of the winder and also of the entire piece on the legs, is very helpful and handy for me. " Linda H.
1. Convenient compact size designed for table-top use. Footprint of winder is 18 inches deep by 18 inches wide. (Cross arms make total width 30 inches and height 35 inches). Total weight is 13 pounds. 2. Solid design of crossarms and yarn 'hands' can handle the heaviest yarns, but being manually operated your lace weight yarns won't suffer. Adjustable to 1 yard, 1 1/2 yard and 2 yard skein size. Easily adjustable knobs tighten yarn hands firmly in a solid metal track. NO slipping, sliding or collapsing. 3. 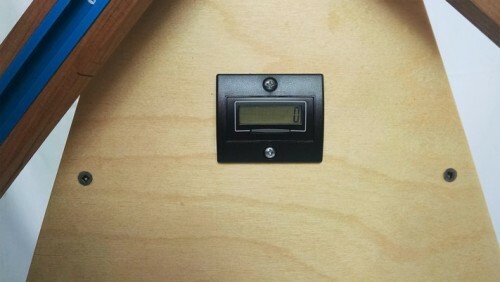 Battery operated digital counter (manufacturer states 10 year life) automatically counts each revolution of the arms. Displays up to 8 digits (99,999,999) and resets to 0 at the touch of a button. 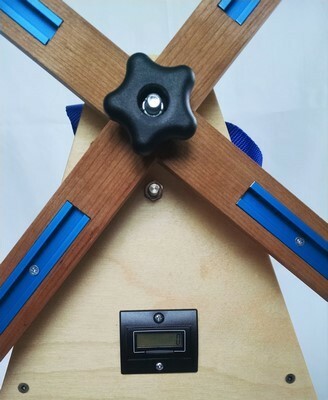 Completely enclosed in the body of the winder so there are NO wires exposed for kids, cats or any accidental snags to yank out. 4. 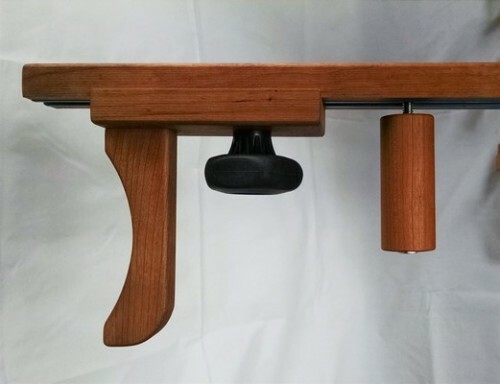 Large, hand-friendly tensioning knob allows you to add just a little drag to the turning of the arms. Adjusted loosely, the arms will spin with the slightest pressure. Screw the knob tighter just a bit and the arms will take more force to turn. I found this useful when re-skeining some yarn that had become hairy and wanted to cling to itself. I was using another winder as a swift and when I tugged on some 'stuck' yarn the arms free-wheeled happily and gave me a big backlash of yarn as you'd see in a poorly cast fishing reel spool. Adding just a little drag when used as a swift prevents that out-of-control spinning on our model. 5. Sturdy feet give a solid stance to resist tipping and feature smooth yarn guides on both sides so you can wind from either direction. Soft rubber buttons under the feet are non-slip and won't mar your work surface. 6. 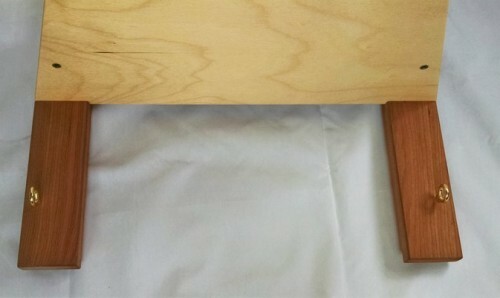 Revolving wood handle will move with you to make turning the arms easy on your wrist and hand. 7. Supple nylon strap provides a secure way to carry the winder from room to room. No need of a counter? We can make the exact same unit but exclude the digital counter. Do you need METRIC measure? We can do that! Just send us an email with your order stating that you would like a metric version. NOTE** Shipping is EXTRA and will be charged separately. We can tell you exactly what your shipping cost will be before you order if you email us with your zip code.